Nurse Heather Posno holds a baby while anesthetist Clayton Reichert looks on during a ORC mission to Cambodia earlier this year. Words that describe Canadian volunteers overseas — modest, polite, friendly, empathetic, inclusive, thoughtful, but most of all good friends and partners. These were the words that inspired Kimit Rai to found Canadian-led surgical group Operation Rainbow Canada (ORC) in 1998. 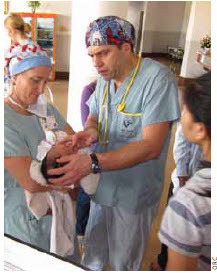 The mandate of ORC is to provide free cleft lip and palate surgery to impoverished children in developing countries. Dr. Rai is a Canadian immigrant born of humble circumstances to refugee parents who fled to Malaysia from Northern India. As a child, he witnessed unspeakable cruelties during the Japanese Occupation in Malaysia. He developed his surgical skills in the Malaysian army as a surgeon, but he was disturbed by the violence of war. When an opportunity to study plastic surgery came up at the University of British Columbia, he moved to a new country, untouched by war on its citizens for the last 100 years. He met and married a Canadian nurse (Linda). For years, Dr. Rai was busy with his surgical practice and raising a family. Then a chance meeting with an American doctor, Bill Riley, led him to join a surgical mission in the Philippines. Surgical nurses Cory Bach and Mary McLaren followed Dr. Rai on subsequent missions. A couple of years later, the three Canadians started Operation Rainbow Canada. Cleft lips and palates aren’t life-threatening conditions. In Canada, babies are operated on quickly and safely. But in developing countries, without affordable options to repair this birth defect, children can grow up with dental or speech problems, difficulty eating and social stigmas. In some cases, eating difficulties are fatal. A Cambodian baby, just after coming out of surgery. Cleft lip and palate surgery is relatively safe and simple and the healing period is quick. Families come in despair and when they see their children post-surgery, their faces reflect overwhelming joy. Fourteen years and 20 missions in nine countries later, Dr. Rai and his team of Canadian medical professionals are still going strong. ORC has helped thousands but there are so many more in need. His energy is renewed by each mission. “We look after poorly dressed children with no money to pay. When they come in, they just stare at your face, hoping that somehow you will give them a chance. They don’t speak your language. You don’t speak theirs. But the amount of trust they give you is very humbling”. Most of Dr. Rai’s mission and his operations/fundraising support team have been with him from the beginning. Ensuring the organization has enough funds to carry on the surgical work is as important as having the medical expertise. Everyone on this multi-cultural team knows that, each spring and fall, there are hundreds of children and their families waiting for them. They gather supplies and instruments and travel as a group. The rest of the year, they raise money. The small organization is entirely volunteer-based — it has no offices and brochures are kept to a minimum. Donations come mostly from members, friends and family. Occasionally ORC receives sponsorship from strangers who are touched by their work. Ottawa artist Kym Shumsky donated the proceeds from “100 Strangers,” a photography exhibit, to ORC. Each surgical mission costs about $28,000 in supplies alone, and up to $70,000 total, including the price of plane tickets, food and accommodations (if the latter two are not provided by the host country, which is sometimes the case). Dr. Rai says the most heart-breaking part of a mission is turning away people who have travelled so far and waited so many days. “Just one more…just one more” is the mantra of mission coordinator Mary McLaren. In recent years, ORC has concentrated its efforts in Cambodia and India. It is always looking, however, at more ways to help other countries in need. One of the most effective ways to help a country is by training local medical practitioners. Canadian residents in plastic surgery and pediatrics can also gain valuable experience from the intensive hands-on training provided by an ORC mission. This experience will then benefit Canadian patients when the residents return home to practise in their fields of specialty. Each country expresses thanks differently. In China, there are speeches; in Mexico, wrapped gifts. In India, there are hugs; in the Philippines, baskets of fruits and vegetables. In Lebanon, they receive pistachios; in Cambodia, fragrant flowers and bows. But each volunteer will tell you there are no words or gifts that trump the perfect smile of a child whose potential will not be limited by the way he or she looks. Gloria Wong is a volunteer for ORC.